THE last three months have been the worst of my life. Full of misery, depression, loss, loneliness, self doubt, frustration and desperation. And no, I have not been forced to watch endless episodes of ‘Hollyoaks’. I have found myself torn from my family and home very suddenly and trying to live in a nursing home. The shock to the system would have been immense anywhere for I am now a mother who does not live with her children, a wife with no husband, a homemaker with no home, a gardener with no garden, a cook with no kitchen. But to add insult to injury the nursing home in question combines people with neurological conditions with people with challenging behaviour or mental health issues. So I am living with people who cannot hold a conversation: I go to sleep to the sound of people screaming and swearing and wake up to more of the same. What is the reason for this strange combination of people? For surely the two don’t always go together; I like to think not in my case anyway! No one seems to know the answer; it seems to be purely historical. So where does someone like myself go to live? The other alternative seems to be elderly care homes but I’m not really elderly either, being only 51. The MS Society no longer has its own care homes. So I am forced to rely on the present ‘specialist’ nursing home. If I was not a raving looney when I arrived here, then I may be when I leave! But one thing has made the difference: the Chilterns MS Centre. My weekly visits have not only stabilised my MS but kept my mental health intact. The sheer warmth coming from the army of volunteers, both front of house and in the cafe, has made me feel so welcome and understood: it is the only place where I have felt that I can be me. 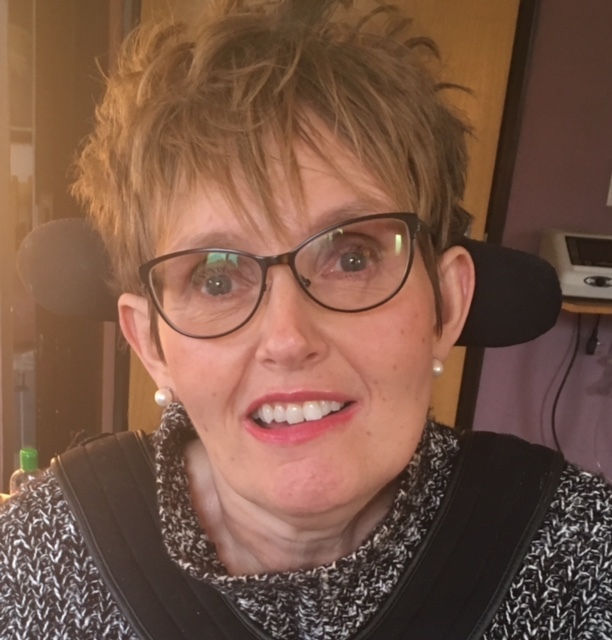 At the centre I feel accepted and valued: my MS shapes me and my life, but it does not define me as a person I have also received a lot of personal encouragement and validation which has meant the world to me and meant that I kept believing in myself. The advice and practical know how has also been invaluable. The art exhibition was a highlight and something I could share with my family. The kids thoroughly enjoyed it. I do not believe this is something that would have been possible in the old building. The centre is now somewhere where I am proud to bring family and friends to visit. It feels like MS has come out of the closet. If we have come this far in just six months then who knows where we will be in six months’ time? The sky really is the limit for us!